An entirely new form of Calendula which combines the familiar old fashioned English Pot Marigold with a rare wild form of the genus. The result is a strong growing almost shrubby plant with immense flower power giving rise to the title 'Power Daisy'. 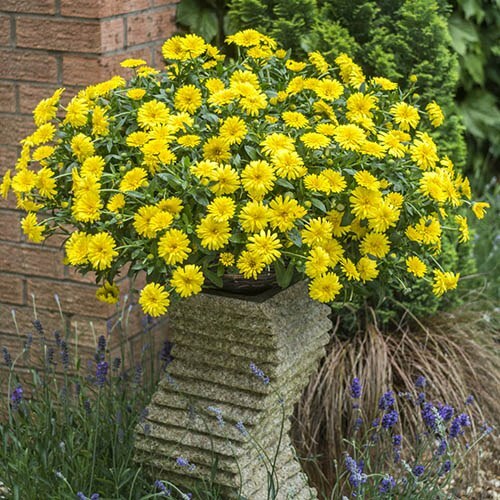 Plants become smothered in brilliant yellow double daisy blooms around 2 inches across which are much more long lasting than usual annuals marigolds. Expect plants to be in dazzling full bloom from May to late autumn - in trials flowering has even lasted till Christmas! Plants do not set seeds meaning deadheading is less essential and are free from the mildew problems of normal marigolds. This fantastic new plant is perfect for containers - 3 plants will fill an extra large 18in pot in a matter of weeks. Alternatively plant in the border for a fantastic display. Power Daisies are easy to grow in virtually all soils and tolerate heat and cold - one of the best new plants to emerge in recent years. Supplied as a set of 12 jumbo plugs. We recommend potting on for 3-4 weeks before planting out.